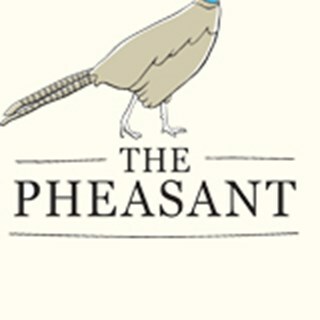 LATEST NEWS - The Pheasant at Keyston has won the award for Cambridgeshire Dining Pub of the Year 2019 !!!!!!!!!!!!!!!!!! 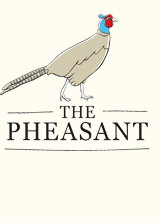 The Pheasant started serving top quality food in 1964, before the term gastro-pub had been invented. It's a beautiful, thatched, traditional inn, 12 miles west of Huntingdon, set in a sleepy farming village. The large bar is a traditional and unspoilt mixture of oak beams, large open fires and simple wooden furniture. At the rear there’s a more airy Garden Room with a sunny and stylish patio garden beyond. Simon Cadge and his partner Gerda Koedijk have been running The Pheasant since January 2012, with John Hoskins (whose family have been involved for 50 years) providing support. Great food, a genuinely warm welcome, real ales, award-winning wine list, log fires and a herb garden. Everything you would hope for in a country inn. My companion has strict food requirements due to medical reasons and the staff were most helpful in describing the menu and offering advice. Always amazing food and friendly service here. had a great time hard to fault. one of the best restaurant in the cambridgeshire. Every time a wonderful experience. Thank you to all you never fail to give 100% service and excellant quality of food. Really enjoyed our visit. We were meeting friends half way and we couldn’t of chosen a better place. Great food, great service at a good price. Six of us met for lunch and everything we chose was superb. We all ate from the a la carte menu. Four had starters, (can’t remember what they had!!) The six mains were fish cake, sausage & mash, roast wood pigeon, braised Cornish lamb and 2 char-grilled & braised venison. Everyone said there meals were fantastic. My lamb was superb. Puds enjoyed were sticky toffee, medlar bread & butter, lemon & poppyseed pancake cake and lime pannacotta. A truly lovely way to spend a Friday lunchtime. The wines, Tinpot Hut and Goats do Roam went down very well. Brilliant , couldn’t fault it. Absolutely amazing, the food was just wonderful complimented with amazing service. A great find! Food was delicious, service great and atmosphere good. Loved the seafood chowder starter, Benison was marvellous and Tarte tatin a great way to finish. The restaurant location is suffering from local road works but you can get their as normal so don’t let it put you off. We had a lovely time. I felt that the mid week lunchtime set menu could have offered a little more choice. However this wouldn't stop us from visiting again. an excellent menu very well executed with a friendly service made for a thoroughly enjoyable lunch . Good service even with a full restaurant on a Sunday lunchtime . Very pleasant and attentive staff. If they were unable to answer any query regarding items on the menu,  they went behind the kitchen door to find out. The gravy for the Sunday roast beef could be thicker but that is just me!!!! The Pheasant is open and accessible despite the diversion signs on A14! What is usually a busy, lively mid-week lunchtime was unusually quiet when we visited yesterday. Don’t be put off. Good service and very good food.